Earlier to mid 19th century, possibly earlier. Segmental-arched, single span footbridge over Dalhousie Burn. Tooled stone blocks; rounded coping stone to parapet. Road covered by grass (2002). B-Group with Dalhousue Castle. This is a small, simply designed footbridge, positioned within the desigend landascape of Dalhousie Castle (see separate Listing). The grounds had open areas of sweepinf curved woodland were referred to by JC Loudon in 1823 as 'extensive and romantic pleasure grounds' which afford 'delightful summer walks'. The landscape was altered in the mid 19th century. The footbridge is situated within the wooded area which bounds the NW section of Dalhousie Castle policies. A nearby stone wall runs along the roadside between the park and Dalhousie Grange (see separate listing) and a doorway within the wall provides access to the footbridge. 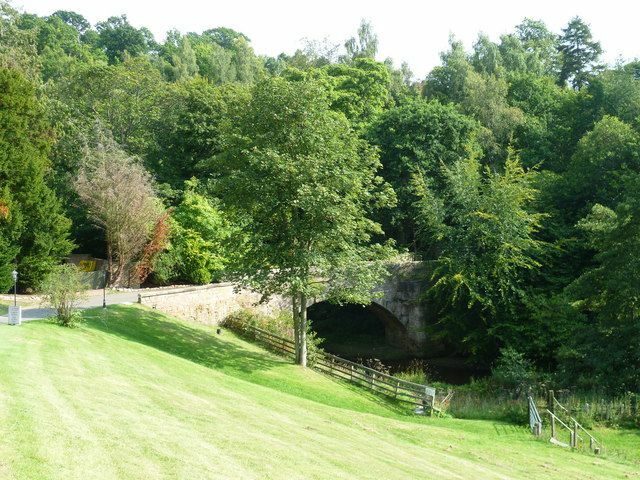 Due to its proximity and alignment with Dalhousie Grange, and adjacent cottages, it is thought that this bridge was used by castle servants.